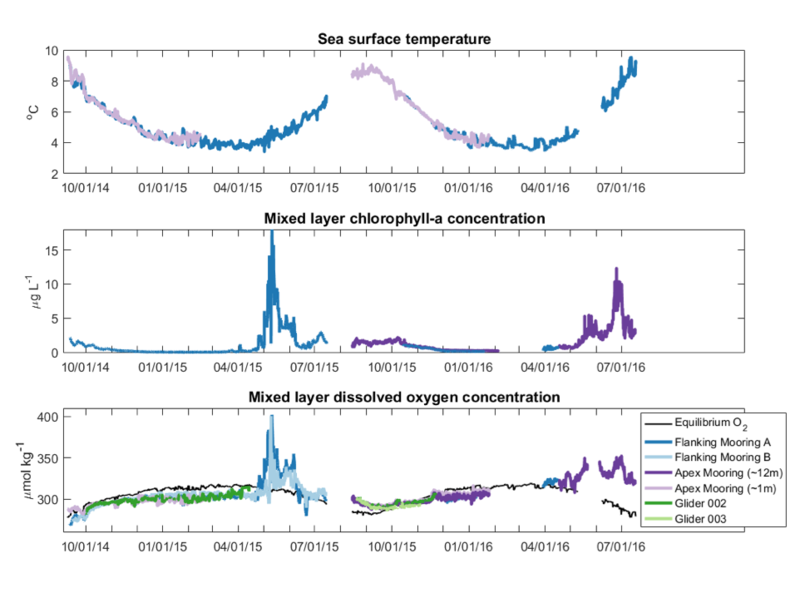 Figure 1: Surface mixed layer (a) sea surface temperature, (b) chlorophyll-a concentrations, and (c) dissolved oxygen from the OOI Irminger Sea Array over the first two years of deployment. Data are compiled from multiple Array assets (see Figure 2b) to provide nearly-continuous data. The oxygen concentration expected if the mixed layer were in equilibrium with the atmosphere, calculated from sea surface temperature and salinity following the equation of Garcia and Gordon (1992), is provided in (c) for comparison with observed concentrations. The biological pump plays a key role in the global carbon cycle by transporting photosynthetically-fixed organic carbon into the deep ocean, where it can be sequestered from the atmosphere over annual or longer time scales if exported below the winter ventilation depth. In the subpolar North Atlantic, carbon sequestration via the biological pump is influenced by two competing forces: a spring diatom-dominated bloom that features large, fast-sinking biogenic particles, and deep winter mixing that requires particles to sink much further than in other ocean regions to escape winter ventilation. We are synthesizing biogeochemical sensor data from the from the Ocean Observatories Initiative Irminger Sea Array of moorings and gliders, to provide the first simultaneous year-round observations of biological carbon cycling processes in both the surface ocean and seasonal thermocline in this critical but previously undersampled region. We hypothesize that carbon respired in the seasonal thermocline is subsequently ventilated during winter convective mixing (>1000 meters), resulting in a significant reduction in potential carbon sequestration. This highlights the importance of year-round observations to accurately constrain the biological pump in the subpolar North Atlantic, as well as other high-latitude regions that experience deep winter mixing. Palevsky, H.I. and D.P. Nicholson (2018) The North Atlantic biological pump: Insights from the Ocean Observatories Initiative Irminger Sea Array, J. Oceanography.